Creamy, smooth, silky, this no egg eggnog is super simple to make and takes very little time to prepare. 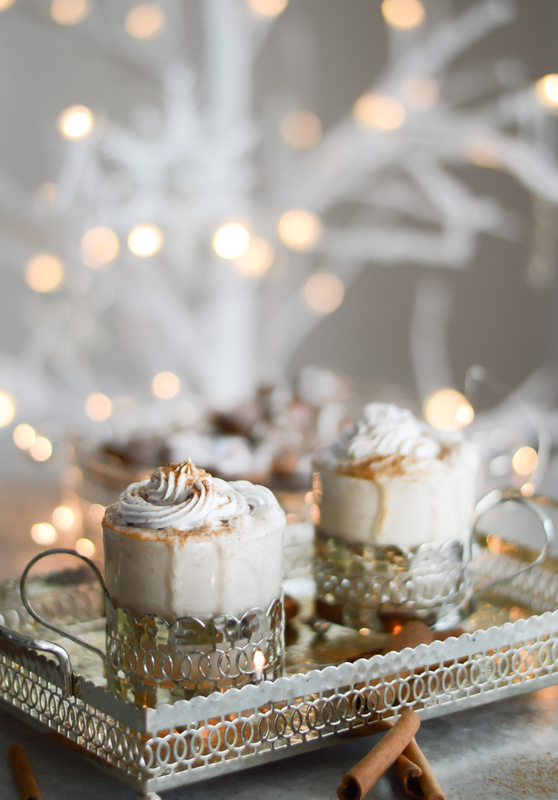 Serve it cold with some ice or as a hot latte with whipped coconut cream and gingerbread biscuits – it’s the festive season after all! Instead, I am frantically trying to finish all the jobs that have been on my ‘to do list’ for weeks, meet all the deadlines, finish writing up all the festive recipes for the blog, edit thousands of photos as well as balance the family life, business and a day job…. Whoa, I think someone definitely needs a well deserved break! How do you find the run up to Christmas? Do you stay super organised and calm or do you ‘secretly’ do some things last minute? I think I need to work on my organisational skills a lot harder next year! Anyway, back to the no egg eggnog! 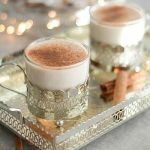 This vegan eggnog is by far my favourite festive recipe yet. Taking a sip of this smooth and creamy brew, spiced with all the Christmas aromas, instantly wakes up all the joyful feelings this festive season brings. 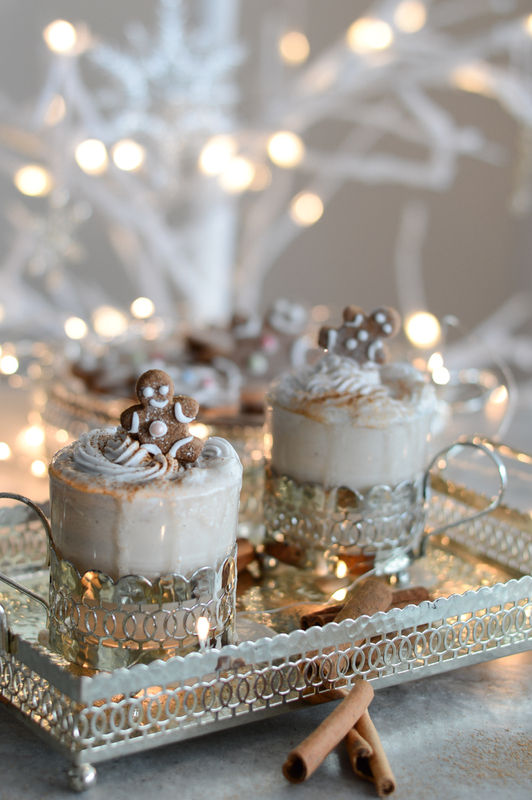 If you’re feeling extra festive, stick some homemade gingerbread cookies on top of your cream and that’s what I call ‘Christmas in a mug’! May I take this opportunity to wish you and your families a wonderful Christmas. Enjoy every minute spent with your nearest and dearest over this holiday season, as this is what matters the most. Happy holidays my dear friends and as always, thank you so much for taking the time to hop over to my blog and re-create my recipes. Creamy, smooth, silky, this no egg eggnog is super simple to make and takes very little time to prepare. 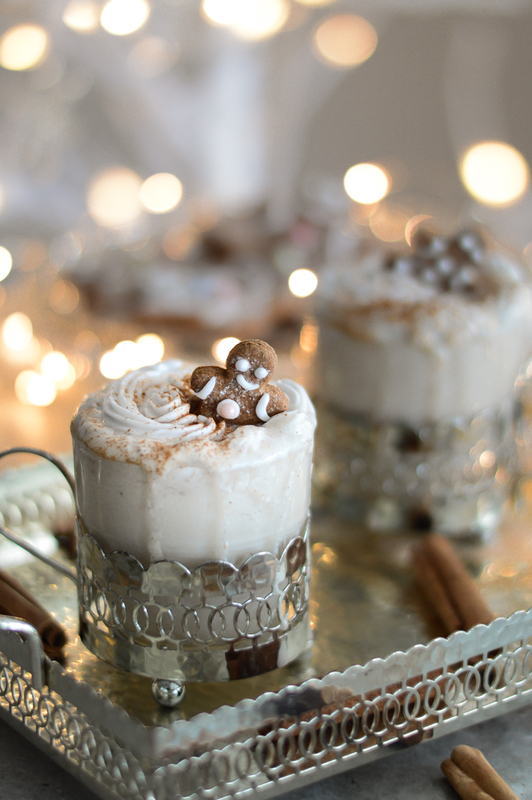 Serve it cold with some ice or as a hot latte with whipped coconut cream and gingerbread biscuits - it’s the festive season after all! 1. Combine all ingredients apart from arrowroot powder in a high speed blender and blend until smooth. 2. Transfer the eggnog mixture into a saucepan and bring to a gentle simmer. As soon as the mixture is starting to bubble, add the arrowroot powder and keep stirring over low heat until the mixture is starting to thicken (for around 5 minutes). 3. As soon as you’ve reached the desired creamy consistency, take the eggnog mixture off the heat and let it cool down completely. Alternatively, you can serve it as a hot latte. If eggnog gets too thick when you serve it later, just add a splash of water to thin it out. I love the photos with the gingerbread men! 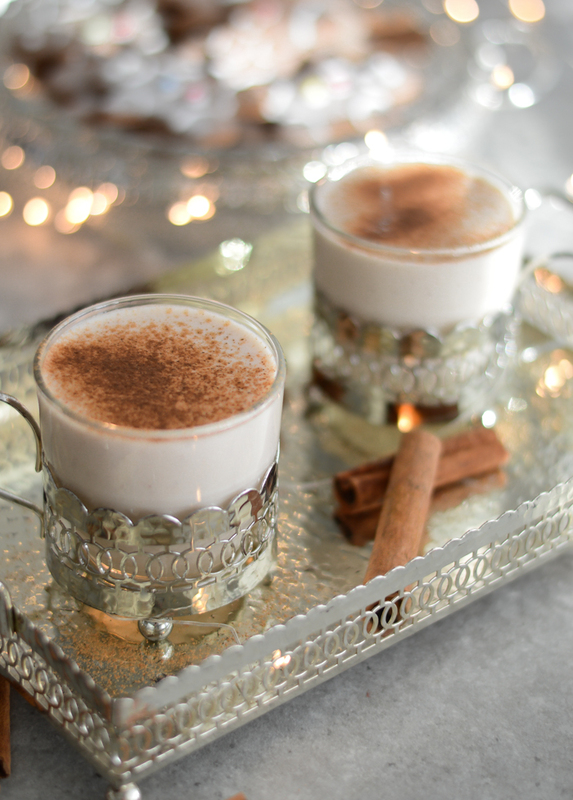 This eggnog looks so delicious! Those glasses are soooo pretty! Yakno, I never really liked regular eggnog but I LOOOVE vegan eggnog hahaha. It’s so much tastier! Can’t wait to try this! It *almost* looks too pretty to drink! Thanks for sharing!! Oh this is fantastic! 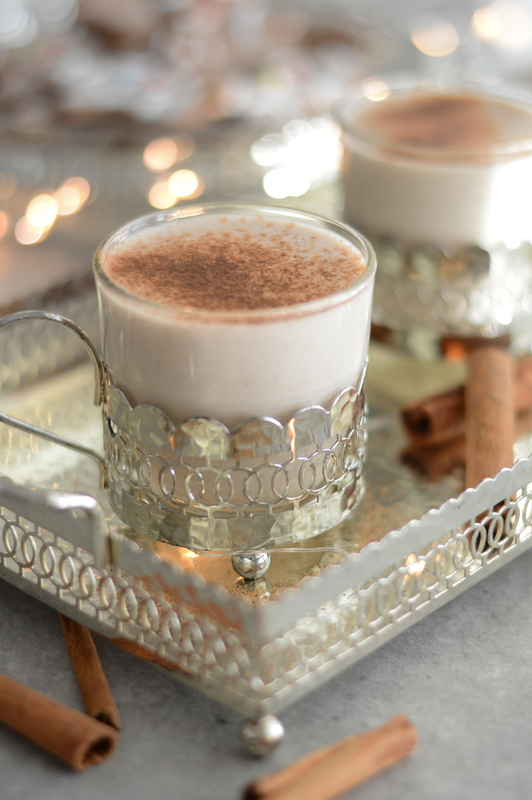 I haven’t had eggnog since going vegan and it was one of my favorite holiday drinks. Thanks for this lovely recipe. I’ll be adding it to my holiday menu. Your photography is truly stunning!! And the gingerbread men on top are too freakin’ adorable! Awesome recipe, thanks for sharing! This is the most beautiful eggnog I’ve ever seen! 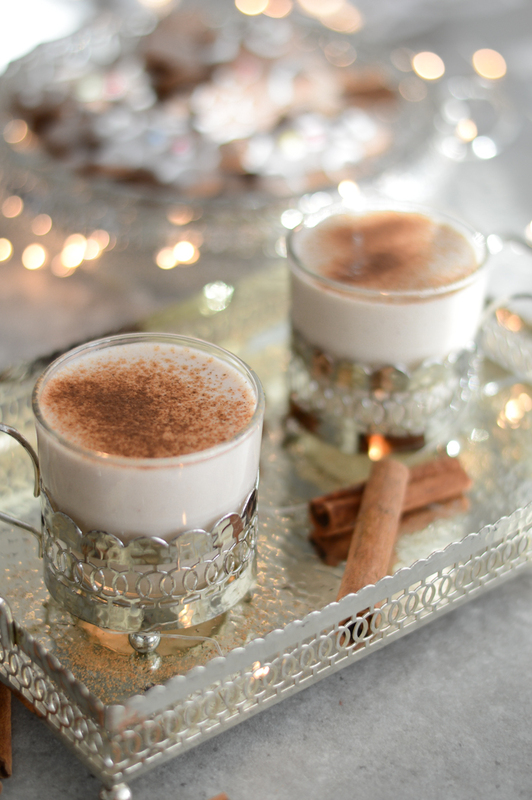 We always make spiked eggnog on Christmas Eve. Happy Holidays! 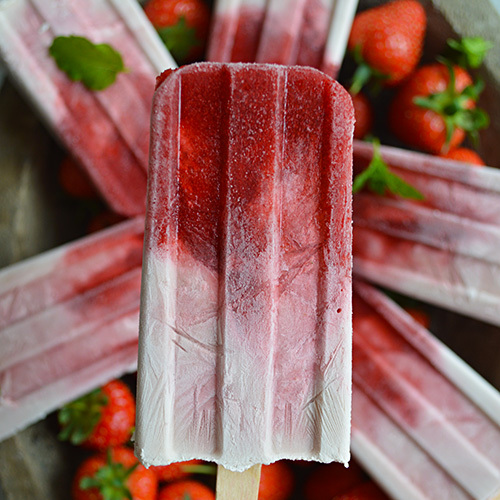 Beautiful photography and a yummy recipe! This would be a special fun drink for my kids as well. This looks absolutely gorgeous Tania ? Such lovely ingredients and I look forward to trying out the recipe. I’m always a little disorganised and rushing around at Christmas, this year was no exception! ? My daughter loves eggnog so much. Thank you for creating this so I can make it for her from scratch! Thank you so much Rezel! I hope you managed to make it for your daughter and I hope she enjoyed it! Wow, so excited to try this recipe out. Thank you so much Paul! PS My blog went down last week and I have to re-reply to some comments, so sorry if I’d responded before. Hope you’re having a great day. Hi! I’m Tania. 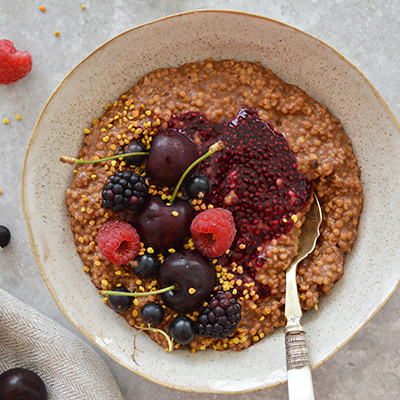 Welcome to my blog, where I share my easy yet healthy recipes for nutritious and wholesome meals, as well as my passion for fitness, wellbeing and travel. All of my recipes are free from gluten and refined sugar and most of them are also candida friendly. Thank you for stopping by and happy browsing.